Psst.. you also may like our Mixed Citrus Ginger Flush, Kale Recharge Smoothie, Sparkling Cucumber and Refresh Detoxer, or this morning drink Rise & Shine Smoothie. Reduce Carbohydrate Intake: All that extra bread (& butta’ too) over the holidays increase carbohydrates and this results in extra water in the body! Other than all of the excess calories you may have consumed which lead to weight gain and make you feel heavy, you also store water in your muscles with carbohydrates. Carbohydrates are stored in your muscles as energy (a.k.a. glycogen) –and for each pound of glycogen, you store three pounds of water—so you may notice that you feel water-logged. Simply add more veggies to your meals, cut back on bread portions, etc. Cleanse With Greens: We love eating greens to “detox”. Although your body is equipped to detox and cleanse itself on its own, naturally, certain health-promoting foods, like greens, assist it in its process. The greens combine nutrients to help your liver in its detoxification process, antioxidants to help your body fend off the damage from toxins and free radicals that occur from everyday living while also providing some anti-bloat benefits.You can mix any up– kale, broccoli, spinach or any of your faves—and get a great smoothie out of it all! They’re low in calories to help fill you up and they contain phytonutrients to fight inflammation and damage from the holiday goodies. Plus, they’re full of fiber to help to prevent constipation and the stomach bulge it causes! Up the Intensity in Workouts: You don’t want to forget about all that hard work you were doing BEFORE the holidays came a knockin’. So get back to the workouts! If you can, up the time and intensity slightly each day to get back into great shape! And if you started to let exercise fall by the wayside, just make an effort to get back to it and do some movement daily to burn off some of the excess calories you consumed! Spinach is an especially great food to have when you want to get back on track after overindulging—one reason is that it is part of the entire anti-bloat, de-puffing, immune boosting, toxin-defeating combo! Spinach is rich in water, hydrating you and helping you to “rinse” out bloating sodium from your body, “de-puffing” you and making you feel lighter. The potassium will also fight bloat as it helps to restore normal hydration status-and its’ fiber will help push waste and toxins out of your colon for a flatter stomach. And spinach helps the liver in its’ first phase of the body’s natural detoxification system. 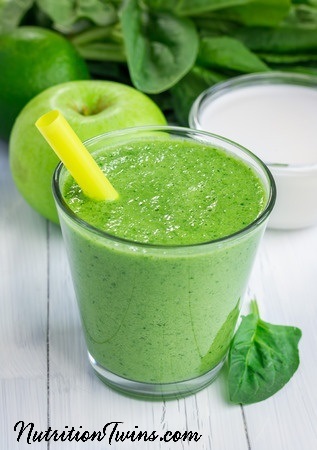 Drink this delish green smoothie to “cleanse” you out and get back on track! We suggest teaming it up with a lean source of protein such as a nonfat Greek yogurt for a light breakfast or snack. Or at mealtime drink it and eat a source of protein and some veggies such as grilled salmon on a top of a mixed green salad with tomatoes and bell peppers. Place all ingredients into a blender. Pulse a few times, then puree until smooth. Add a small amount of ice to give it more juice. Make sure all ingredients are evenly smooth before pouring and enjoying!